Gangaram Munda of Kasira village in the Koida region of Odisha’s Sundargarh district, is now 40. He remembers working in an iron ore mine until 15 years ago before the companies started getting labour from outside and mining became increasingly mechanised. “Things have changed now. There are more machines involved and people like me are not needed,” he states. Now, he works as a labourer at a small farm close by which provides for his food for about five months. At other times, he does odd jobs to stay afloat. Many others in his village, however, travel out in search of jobs. The road to Koida is not an easy one, especially when you are travelling from Rourkela. It winds through the hills, is unpaved in most parts and the cloud of red iron ore dust is unmistakable. The constant traffic of ore-laden trucks plying to and fro only adds to the traffic and dust. But this dusty and bumpy road is what connects many people of this region to their jobs in urban areas such as Rourkela. With not much livelihood options around, many men travel this route to seek manual labour so that they can sustain themselves and their families. Koida has the highest concentration of iron ore mines in Odisha’s Sundargarh district. In 2017-2018, Odisha reported a production of about 104.98 million tonnes of iron ore, which is nearly half of India’s total iron ore production. Most of this comes from two districts — Keonjhar and Sundargarh. The gains from iron ore mining in the region are therefore huge. These riches have clearly missed the locals. 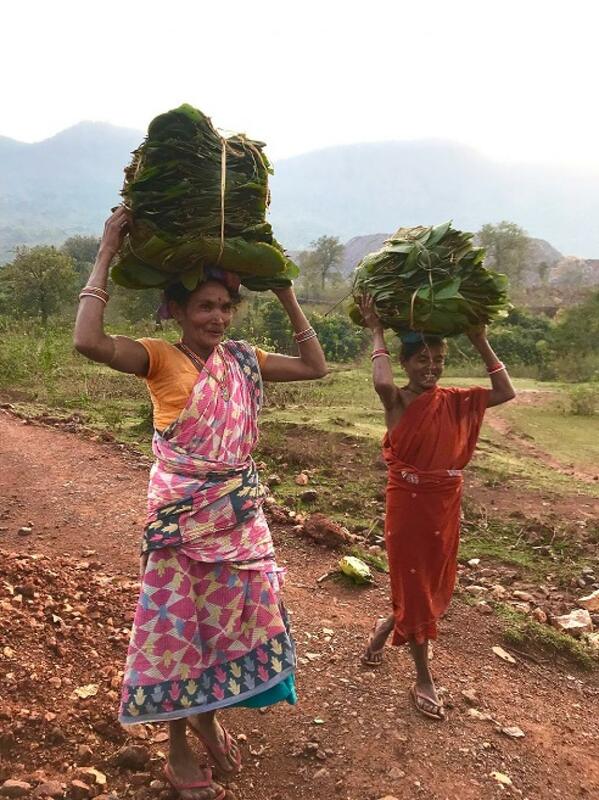 Tracing the contiguous iron-ore belt from Sundargarh down to Keonjhar, livelihood and poor income is a univocal problem in the rural parts of these districts. For them, mining has only plundered their soil, their water, and their forests. It has made them impoverished and insecure. In March 2015, India’s central mining law, the Mines and Minerals (Development and Regulation) Act, was amended to create provisions for developing a non-profit Trust in every mining district of the country, called District Mineral Foundation (DMF). The purpose of DMF was stated clearly in the law, “to work for the interest and benefit of persons and areas affected by mining-related operations”. Observing that the benefits of mining must be shared with local communities, the law obligated mining companies to pay to this Trust. The payment will be determined as 30 per cent equivalent of the royalty that the company pays to the state government for mines granted before 2015, and 10 per cent of the royalty for mines granted after that. Considering the scale of mining in Odisha, it has the biggest share of DMF funds in India, which is more than Rs 6,300 crore. Keonjhar and Sundargarh are the top two districts in terms of collection, having about Rs 2,700 crore and Rs 1,100 crore respectively in their kitty. With such funds in DMFs, the opportunity to alleviate poverty and unemployment and give economic security to the people in the area is huge. A Below Poverty Line (BPL) Census conducted by Odisha’s Panchayati Raj department enumerates about 65 per cent of the population in Sundargarh district to be BPL; Keonjhar’s economic profile (2018) categorises 69 per cent of its population as BPL. Moreover, the socio-economic caste census (SECC) data shows that in close to 90 per cent of rural households in these districts, the highest earning member earns less than Rs 5,000 a month. Unemployment is rampant, with about 43 per cent and 36 per cent people within 15-59 years of age being “non-workers” in Sundagarh and Keonjhar respectively. This age-group is recognised in India as the age group which should be working or employed in economically gainful activities. In Nitigotha, a small village in Keonjhar’s Banspal region, Shakuntala Dehuri keeps pointing to the iron ore mine (located about 8 kilometres away) which has caused all her field’s soil to turn red. Dehuri is a small farmer who, like many others in her village, grows seasonal vegetables in her field. Till about a decade ago, her field’s produce was sufficient enough to both sell in the local market and to feed her family. “But red water runs off from the mine each time it rains and over the years, the amount and quality of the vegetables have gone down. I do not have enough to sell anymore,” says Dehuri. She says she used to cultivate around 12 quintals of vegetables and now the yield has almost halved. Her concerns are echoed even as one travels ahead towards Kumundi and Uparjagar villages. Nitigotha is a tribal village where people mostly depend upon agriculture and collection of minor forest produce. The villagers say that their village will soon be under the Gandhamardan mines project, and they will lose access to a part of their forest when that happens. “Apart from losing the forest, forest-dependent communities also lack support for storage, market linkages for the forest products they collect, for proper implementation of minimum support price so they can get good rates for their collection,” says Bhabesh Kar, who is associated with a local non-profit Keonjhar Integrated Rural Development and Training Institute (KIRDTI). In Keonjhar, about 37 per cent area comes under forest. In some of the big mining-affected blocks like Banspal, Jhampura and Champua, the area under forest is 50 per cent. Sundargarh’s Koida and Lahunipada regions have about 55 per cent forest area. This explains the dependence of people on the forests and the natural resources so abundantly available here. People here usually gather minor forest produce such as mahula, kusum knots, tamarind, sal leaf, mushroom etc. With a focus on mining-affected areas and people, DMF has opened up a major opportunity to address many long-standing issues that burden communities affected by mining operations. “This should be used to support the small and marginal farmers and forest-reliant communities to scale up their work and connect them to a profitable market so that they can earn a steady income,” says NK Mishra of Sundargarh-based Centre for Integrated Rural & Tribal Development (CIRTD), Sundargarh. So what is Odisha doing? Unfortunately, DMFs in most districts of Odisha so far have not made the necessary investments to improve livelihood and income security. An assessment of DMF implementation by Delhi-based non-profit Centre for Science and Environment (CSE) done in July 2018, showed that over the past three years, focus in the districts on livelihood generation had been nearly absent. Of the total investments worth Rs 938 crore in Keonjhar through DMF, only about two per cent was for skill development and construction of a driver training centre. There were no investments on this in Sundargarh. In both districts, no investments we made till then on natural resource-based livelihood. The good news is that the Odisha government had recognised the problem. To ensure that DMFs make necessary investment to improve livelihood opportunities in these mining districts and the people, the state government in September last year, made amendments in their DMF Rules, adding livelihood as a “high-priority area” for DMF investments. The rules emphasise on support for livelihood, income generation and economic activities for mining-affected people. Some action has now begun. Keonjhar has initiated the wadi project, an agro-forestry initiative through DMF, in Jhumpura and Keonjhar, where agricultural land has depleted due to mining. The initiative covers about 1,500 families who would be involved in the wadis. The model is well-known for improving income through horticulture by planting of economically-beneficial species such as gooseberries, cashews, mangoes etc. The work is through a convergence model already proposed by NABARD. “DMF has given an opportunity to fund works which were not happening due to shortage of funds or lack of coordination. There is a better understanding of the needs now and we are trying to have more projects where benefits to people are sustained,” says Ashish Thakare, collector, Keonjhar. These livelihood projects will provide hand-holding support to the communities involved for a period of six to seven years, after which it will be entirely run and managed by the people. The district is also taking up tasar rearing in mining-affected areas involving tribal farmers who are currently engaged in sup-optimal rearing. This project will also be done through convergence of DMF with MGNREGA. While there is a start, the key to betterment and scaling up such initiatives will take need-assessment and involvement of people in decision-making and monitoring of these works, as also the law states. DMF is clearly an opportunity. Whether it will live up to its promised potential, in Odisha and other mining regions, remains to be seen.